Oregon was awarded a $1.25-million Green Jobs Labor Market Information Improvement Grant in December 2009 aimed at increasing the state’s understanding of green jobs. One goal of the grant is to identify Oregon’s green sectors and track employment and wages in those sectors over time. The transportation sector is the fifth to be studied under the grant. There are a number of groups throughout Oregon involved in identifying and measuring green sectors in the state. One of those groups – the Oregon Green Jobs Council – is legislatively responsible for, among other things, identifying high-demand green industries in Oregon. 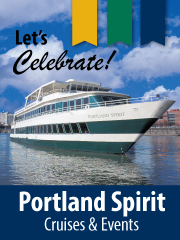 The Oregon Green Jobs Council has identified green transportation as one such industry. The green transportation sector, as defined by the Oregon Green Jobs Council, includes firms involved in researching and producing electric vehicles, fuel cells, and advanced batteries; providing mass transit; or conducting emissions controls and other tests. Firms were identified by a number of on-line lists and registries and include firms ranging from local governments providing transit services to private firms producing electric motorcycles. The combined list of firms indentified in the green transportation sector includes 57 Oregon entities. Thirty-eight local government entities are included and 19 of the companies are private sector firms. This is not a study of green jobs (those with specific job duties related to producing green products) but a study of all employees at the establishments identified. No effort was made to determine or calculate the net environmental impacts of the products produced or services provided. The majority of jobs in the green transportation sector are in local government entities (95%), while private entities account for only 5 percent of green transportation jobs. The majority of green transportation employment is in the non-education government industry and in transit and ground passenger transportation. The green transportation sector boasted the largest increase (13% or 7 employers) in employers from 2004 to 2009, when compared with private entities in all Oregon industries (5%, 4,763), all Oregon industries similar to green transportation (3%,117), and private entities in similar industries (2%,78). Although green transportation firms grew in number at a faster rate than other categories, the numerical increase was much smaller than the increases in the other categories. Employment at these establishments totaled 12,776 in the fourth quarter of 2009, an increase of 3 percent (406 jobs) from the fourth quarter of 2004. Employment at private firms in similar industries increased 9 percent (5,700 jobs), while employment at all establishments in similar industries increased 6 percent (7,028 jobs) during the same period. Oregon’s entire economy lost 29,987 jobs (-2%) during the five year span. The transportation industry as a whole was more stable during the recession than Oregon industries in general. However, the green transportation sector expanded less than private and total jobs in similar industries. Jobs in Oregon’s green transportation sector make up about 10 percent of total employment in similar industries, and account for less than 1 percent of all employment in Oregon. Ninety percent of workers in the green transportation sector are employed at firms with 100 employees or more (Table 1). The distribution of jobs by company size class within the green transportation sector is sharply skewed toward large establishments compared with all jobs in Oregon’s economy. Total employment tends to be more evenly distributed between small and large employers, with roughly 43 percent of employment at firms with less than 100 employees. There was a modest decrease in the number of wage records at green transportation firms from the fourth quarter of 2008 to the fourth quarter of 2009 (Table 2). The sector performed better than the economy as a whole: the total number of people on the payrolls of Oregon’s non-federal employers dropped by 5.9 percent over the year. Total wages paid by green transportation firms dropped slightly from the prior year compared with slightly greater declines at all non-federal employers. The average wage for all non-federal employees grew over the period, while average wages in the green transportation sector declined slightly. Total wages paid at firms in the green transportation sector during the fourth quarter of 2009 were approximately $154 million, roughly 1 percent of the total non-federal wages ($16.7 billion) paid during the period in Oregon. In general, a slightly larger share of employees working in the green transportation sector earned high wages compared with all employees during the quarter (Graph 1). Within the sector roughly 35 percent of employees earned at least $30 per hour, compared to 22 percent for all employees. 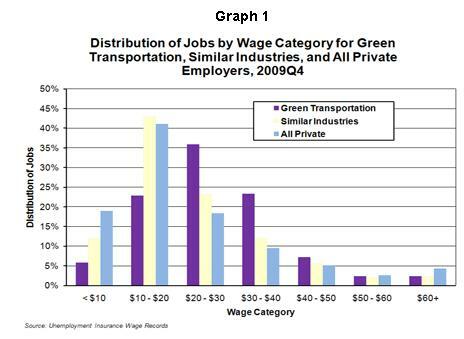 The median hourly wage for the green transportation sector was $26.51 during the fourth quarter of 2009 while the median wage for all employees was $16.84. Employment in the green transportation sector outperformed the economy as a whole during the five-year period from the fourth quarter of 2004 to the fourth quarter of 2009. However, similar industries to green transportation in both the private sector and in the economy as a whole outperformed green transportation. Compared with the rest of the economy, the sector experienced increases in employment during the one-year period ending in the fourth quarter of 2009. However, from 2008 to 2009, average wages decreased slightly compared with an increase in the economy as a whole. This may indicate the sector is relatively steady compared with other sectors, and was likely not as affected by the recent recessionary cycle as other industries.